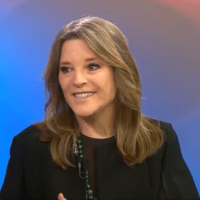 Marianne Williamson, an activist and best-selling nonfiction writer, unsuccessfully ran for Congress in California in 2014; her campaign theme song was penned by Alanis Morissette. “We have millions of American children live in chronic despair and trauma. We need to discuss this. We have systemic racism — layers of systemic racism that are leftovers from slavery. We need to discuss this. And while we are good at preparing for war, we do not wage peace on the levels we need to. We need to discuss this,” Williamson told CNN.